To the question of RF noise from AeroLeds, I did have a problem with the first generation of AeroLeds in my RV-10, but the problem was much more severe with the comm radio (antenna on the belly). Working with Dean at AeroLED I was able to eliminate 95% of the noise via different grounding approaches, but then Dean just sent me the current version of the wingtip Nav/Strobe and the problem was gone. I do however mount the wingtip VOR antenna toward the middle of the wing rib instead of the forward area just to gain a few inches of spacing with the Nav/Strobe. No RF noise. Performace is as I previously discribed - this $2 or so antenna does everything you need for VOR, LOC and GS reception. I have not used the Archer Nav antenna but I’ve seen them. If up to me I would mount the antenna on a small piece of 0.063” aluminum to the outboard rib, not the wingtip (that way you can remove the wingtip without removing the antenna, and it solves the grounding problem). I would also lengthen the leg that extends into the wingtip to the maximum extent possible (and shorten the trailing leg the same amount). I would also not do the wire to the NAV/Strobe along the antenna as discussed in the Archer instructions. No matter what however, I would check the antenna tuned to the proper frequency and matched to the feed line (here you need an antenna analyzer as discussed in my other post). I have installed a RAMI AV-520 antenna in the top of my Vertical Stabilizer on my RV-10. I haven't got the 10 flying yet so can't comment on how effective the antenna will be, but it was a relatively easy install. With the height of the VS on the RV-10 it shouldn't be an eye hazard to even the tallest basketball player <grin>. If you would like some photos of my install, send me a PM with your email address and I'll send them to you. I don't have an on-line photo account set up so can't post pics to this website. I am kind of thinking toward what Carl said about not ever using the VOR. I would be interested in hearing from anyone that did not even install a VOR antenna. I’m just not sure it even worth the effort or expense of he install. As a data point, I fly about 800 hours per year for work and even more adding in the GA time. I can’t even remember the last time I used a VOR except for Instructing PP students...and once they have the VOR lessons complete, they don’t use them either. FYI, both work and instructing aircraft have IFR GPS. What is your risk tolerance? Some have opted to fly ifr with a single efis and one gps nav radio, nothing more. The FAA says it’s legal, but is it wise? What’s your plan if that one gps box goes kaput, or if the government, a solar flare, or evil person jams the satellites? Question for Carl: I installed a stock Archer nav antenna. But like you, I moved it aft a bit. Like you, I disregarded Bob’s installation instructions wrt nav/strobe wires. And like you, I am perfectly happy with it. I keep reading complaints. Do you think it’s possible that the original instructions are simply wrong? The question is are you going to fly VFR or IFR? If VFR only then I'd say forget the VOR antennas and receivers all together. The Future is GPS!! I can’t comment on the actual Archer antenna performace or installation instructions - but I know a lot of people are happy with theirs. Considering the vast majority of people using the Archer antenna simply slap it in and go, never checking it with an analyzer, might be the root problem why a few are disappointed in how it works. I can comment on the Archer comm antenna. 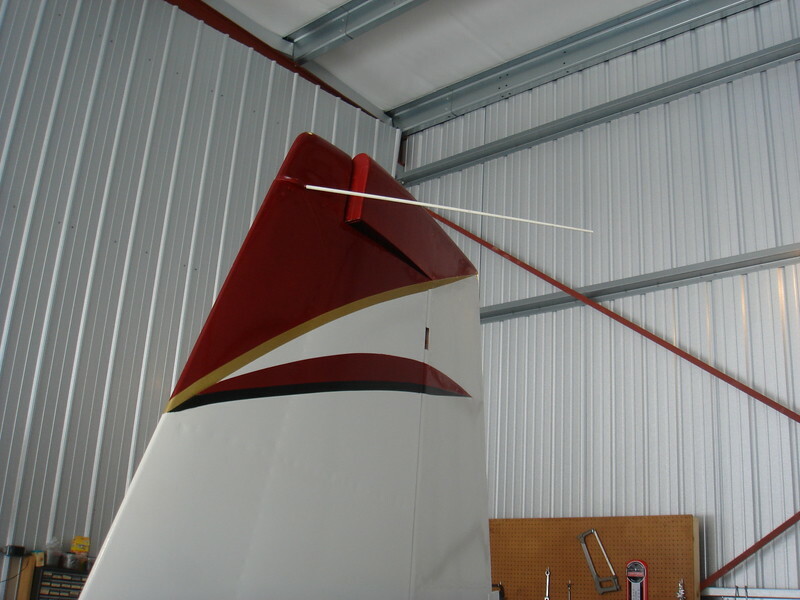 Years ago I flew with a homemade wingtip comm antenna in my RV-8A. A buddy in an RV-8 had a Archer wingtip comm antenna. When building mine I made sure I got the maximum vertical distance on the arm that extends out from the rib (this is where almost all the radiated power, send and receive, is located). We did a flight one day talking to Approach (very loose formation). I had full quieting in my comms, but Approach could not hear my buddy and I had to relay for him. While my buddy might have screwed up installation, I suspect if he tuned it with a real analyzer that might have made a big difference. Side note - I later installed a second radio in this first airplane and used a standard bent whip antenna on the belly. The bent whip antenna always worked better than the wingtip comm antenna, but the comms on the wingtip antenna was still acceptable. For the current RV-8 project I will again use a wingtip comm antenna for Comm #2. +1. I have had exactly the same experience. One Archer-clone with the high current leading arm bent down as much as possible; one belly whip. The wingtip is generally not as good, but nowhere near as bad as many of the posts I see here. All - Thanks for the quick responses. Wonderful validation that Vans products have an active and passionate fan base! I do plan to fly IFR as that is part of our cross country mission. Having the ability to listen to a VOR for FSS or Hiwas as well as a backup for approaches that is not dependent on GPS has significant value for me. While it is unlikely for me to use VOR for navigation, the redundancy is something that has merit. We do have small kids so putting the antenna under the tail is probably not a great idea but I am curious about the benefits of putting the antenna down there as it seems many people do this? For those who have done this please weigh in? The Archer wing tip antennas appear to be a nice compromise but I am trying to limit the items that may need "tuning" for optimal performance. Static Wicks - I'll take it from the few responses that VERY few people install them and even LESS have issues without them?